Yesterday I attended "Antiques Roadshow" in Detroit, Michigan. I have watched the show many times and was thrilled that I was selected for tickets. I decided to bring three paintings by Joseph S. Trovato (http://www.aaa.si.edu/collections/interviews/oral-history-interview-joseph-s-trovato-12039). 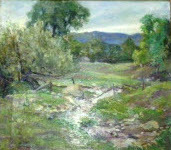 These paintings were owned by my grand aunt, Isabel Williams Hamlin. See my previous posts http://www.theartofgenealogy.com/2013/03/order-of-american-true-ivorites-isabel.html and http://www.theartofgenealogy.com/2012/09/city-directories-littlecote-hobby-shop.html. Isabel and her husband, Earl Hamlin, owned the Littlecote Hobby Shop in Utica, New York. 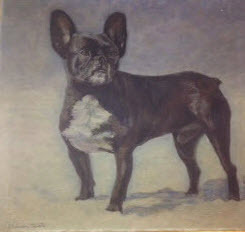 I believe that Isabel must have known Joseph Trovato personally because some of the pictures are of a personal nature, such as a portrait of her dog. See one of my earlier posts about this dog: http://www.theartofgenealogy.com/2013/03/wordless-wednesday-dogs-are-part-of.html. 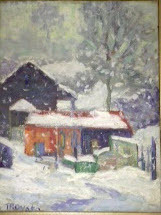 Joseph Trovato was Assistant Director at the Munson-Williams-Proctor Arts Institute in Utica, New York (http://www.mwpai.org). I wanted to find out the value of the Trovato paintings. My husband and I arrived at Cobo Center in Detroit at 10:30 a.m. and began our long wait in line. Preparation is the key to an event like this. We had been warned that the lines would be long, and they weren’t kidding! We waited three hours just to get the point where they tell you what category line we should stand it—in our case it was “Paintings and Drawings.” Then began another long delay. I had purchased a luggage cart to carry the paintings, so that made the wait a lot easier. I passed the time by chatting with others in line and admiring the items that others had brought. There was an adorable old baby carriage, a bracelet made from buttons, pottery, a rocking chair, dolls and paintings—lots of paintings! I got a glimpse of the famous furniture appraisers, Leigh and Leslie Keno (http://en.wikipedia.org/wiki/Leigh_and_Leslie_Keno), who grew up in Mohawk, New York, not far from where I grew up. While waiting, I watched the live filming of people who were chosen for the show, which will air between January and May 2014. 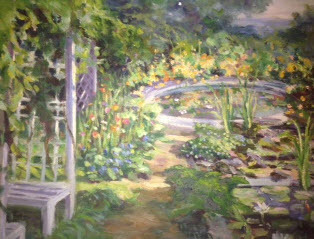 At last I arrived at an appraiser, Betty Krulik (http://www.bkrulikfineart.com/aboutus1.htm), who fortunately was from New York. Ms. Krulik was well acquainted with Joseph Trovato and told me that he was a renowned scholar and had compiled a comprehensive book on Charles Burchfield. A search for Joseph Trovato on Amazon.com produced several results (http://www.amazon.com/s/ref=nb_sb_noss?url=search-alias%3Daps&field-keywords=joseph+trovato). She was surprised to see paintings by Trovato as he was mostly known as an esteemed curator, lecturer and author. On her computer she searched for Trovato works that had been sold in the past; unfortunately, there was only one in her database, and it was for a small amount. She sent an e-mail to the Munson-Williams-Proctor Institute to see if they had any interest in the paintings by their former employee, and I am to contact her later to see how they responded. So I did not become a millionaire! However, I had an outstanding day and consider it right up there with attending the original Woodstock (that will have to be another blog post). 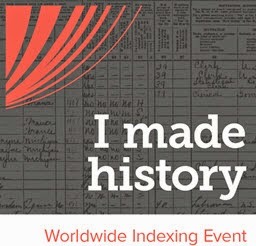 DO YOU HAVE OHIO ANCESTORS?